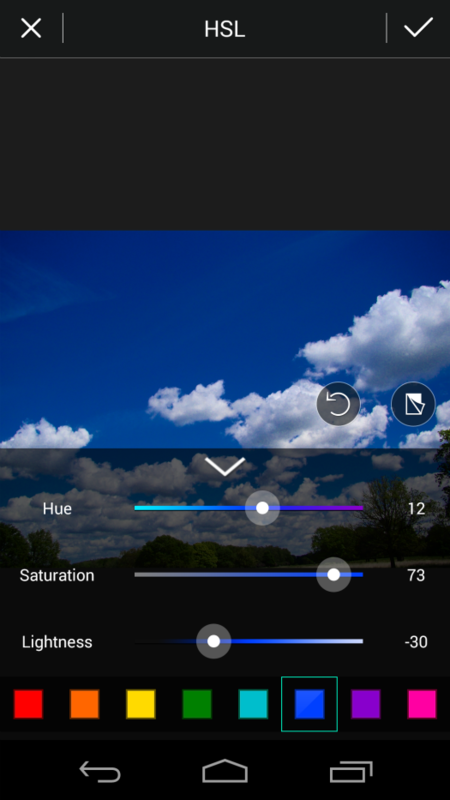 Sometimes it is tempting to ensure that the sky is in the right colour of blue, and when I am using my smartphone to edit images, PhotoDirector is the app I turn to in such instances. This is a picture taken in Richmond Park on Sony DSC-H50: not a good photograph, but serves to demonstrate the editing process. Image (1) is the original, and (2) is touched up using PhotoDirector, and (3) shows before and after the edit. Lower on the page, I have posted a number of screenshots tracking what changes I made to the image. Open the image on PhotoDirector (1), choose Adjust and HSL (2), which brings the screen (3), choose the colour blue in this case (4), alter the settings (5), in this case altering hue, saturation, and lightness, and tap on the check / tick mark at top right, and at (6) save by tapping the disquette icon.